It’s always good to have a couple hot dip recipes on hand. We like to make them every once in a while and have an appetizers only dinner. They are also absolutely essential to have on hand when you’re going to have guests over. 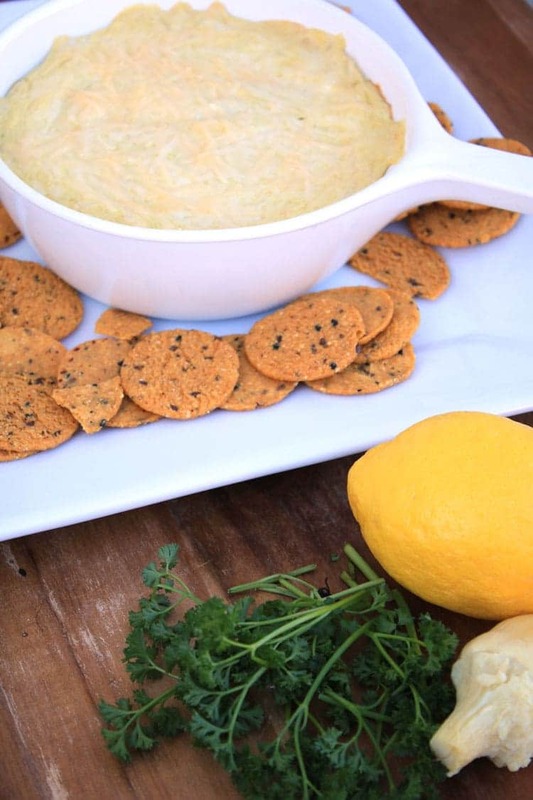 This Low Fat Artichoke Dip is Delicious! 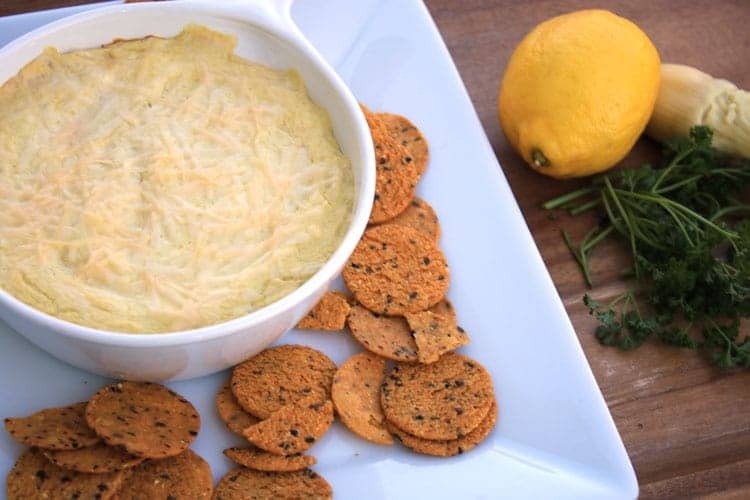 This Easy Artichoke Dip recipe is crazy fast to make. Seriously. Grab your food processor or blender and you’ll be ready to whip this up in no time. The blending is the super fast part, and then you do have to sit and wait for this deliciousness to cook up in the oven for 20-25 minutes. But really…you need to develop a little patience anyway, don’t you. Just saying. 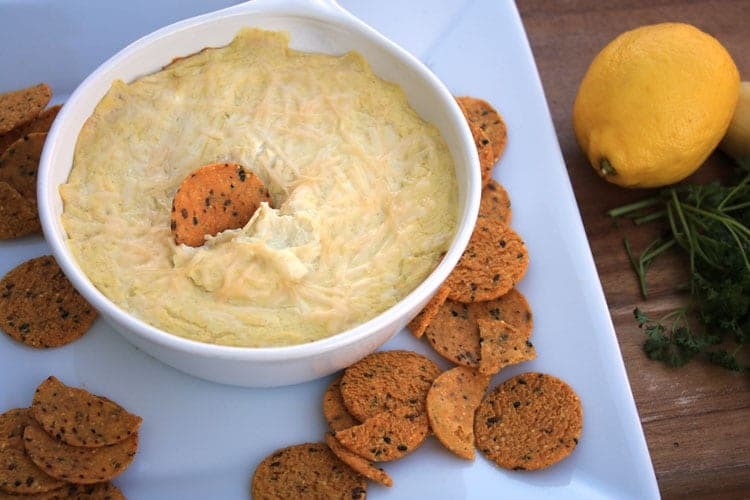 We seriously have about a gazillion dip recipes, but those are a few of our favorites. You can’t go wrong when you’re serving appetizers. People like to graze. I sometimes think it’s a natural human instinct. You’re at a party…around people (obviously)…and you graze. At least I do. We love pairing Hot Artichoke Dip with gluten-free crackers. 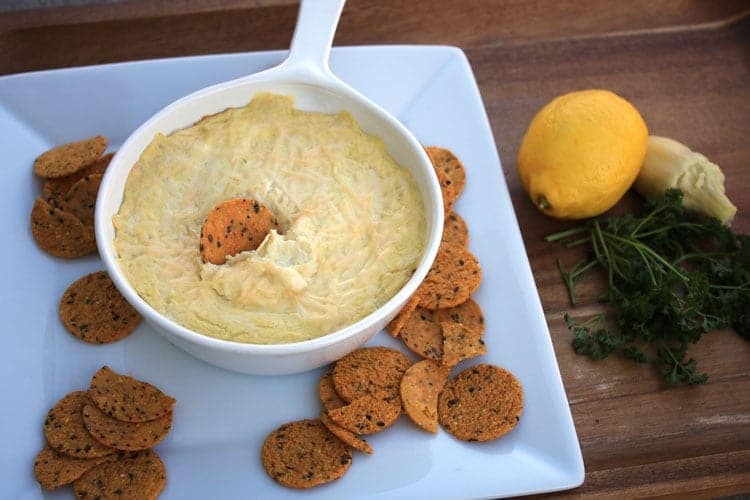 No–they are not always easy to find, but when you are serving up a dip recipe to someone who has a gluten-sensitivity (like my daughter)…well, it’s best to find gluten-free crackers. Entertaining tip–if you happen to have a guest who cannot eat gluten, make sure you have something that they are able to eat and let them know what is gluten-free and what is not. We have AMAZING friends that make sure that my daughter always has something to eat when she comes over. This is no small task, but it is SO appreciated! The flavors in this dip are a combination of artichoke, lemon, garlic and pepper. The blend results in a delicious creamy concoction that it so easy to scoop up over and over again. Watch yourself…this dip could be addictive. Although we served up our Hot Artichoke Dip with gluten-free chips, it would be equally tasty with French bread, tortilla chips and other types of crackers. Use what you have on hand, or go splurge on some good stuff. 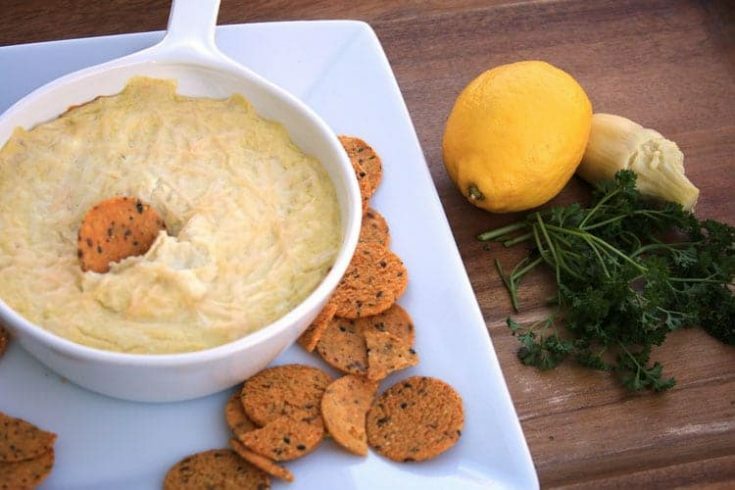 Whatever you pair this dip up with, the Hot Artichoke Dip will be the star of the show. Combine cottage cheese, flour, lemon juice, white pepper and garlic in a food processor or blender. Blend or process until smooth. Add in artichoke hearts an 1/4 cup Parmesan cheese. Process until the mixture is only slightly chunky. Spray small casserole dish with cooking spray and then spread artichoke dip into the dish. Top with the 2 tablespoons shredded Parmesan cheese. Bake at 400F for 25 minutes or until the top is slightly browned and edges are bubbly. Serve with crackers, bread, or pita chips.